Dr. Adam Shar, UT Health East Texas orthopedic surgeon, answered some common questions about this disease for Rheumatoid Arthritis Day. Rheumatoid arthritis is considered a systemic disease. What does this mean? Systemic disease means that the disease is not isolated to a single organ or body part, and therefore can affect multiple organ systems. In this case, while rheumatoid arthritis (RA) most commonly affects the musculoskeletal system (i.e. joints, tendons, ligaments), it can also affect structures such as the heart, lungs, nervous system and skin. In addition, rheumatic arthritis is an autoimmune disease, which means that the body’s immune system mistakenly attacks its native tissues. This results in inflammation and progressive destruction of the affected tissues. Who is most affected by rheumatoid arthritis? Onset of rheumatoid arthritis can occur at any age, but most commonly occurs in those 30 to 50 years old. It is more frequently seen in females than males (approximately 3:1 ratio). Another risk factor includes a positive family history, as genetic factors contribute to one’s likelihood of developing RA. There is also an association between smoking and rheumatoid arthritis, especially in those with genetic predisposition for the disease. When should someone get checked out for rheumatoid arthritis? One should get checked for RA if he or she develops pain, swelling and stiffness involving multiple joints. Symptoms commonly affect both sides of the limbs, and are often debilitating and have a profound effect on quality of life. Individuals with family history of RA who develop these symptoms should have a low threshold in checking for RA. Stiffness tends to be worse in the morning and improve throughout the day. As the disease progresses, joint deformities may develop and are more obvious in smaller joints (such as hands, wrists and feet) than in larger joints. In the upper extremities, the most commonly affected joints are the wrist and knuckle (also known as metacarpophalangeal) joints. Non-musculoskeletal symptoms such as fatigue, weight loss and low-grade fever may also occur. It is important to differentiate RA from osteoarthritis because treatment differs between these two conditions. Osteoarthritis is the most common type of arthritis, and it is caused by wear and tear of the cartilage that occurs with time. On the contrary, RA occurs as the body’s immune system attacks its native tissue, causing progressive tissue inflammation (synovitis) and joint destruction. It is also important to differentiate RA from other types of inflammatory arthritis (such as lupus and psoriatic arthritis). Evaluation for RA begins with patient history and physical exam. X-rays help determine severity of joint destruction and may also help differentiate rheumatoid arthritis from osteoarthritis. Blood tests also play an important role in determining whether a patient has RA. What do you recommend people with RA do to relieve pain? Early recognition and treatment of RA is essential to help halt disease progression. Goals of treatment are to minimize pain, improve quality of life, prevent progressive joint destruction/deformity and monitor as well as control non-musculoskeletal manifestations. Exercise and a healthy lifestyle can be beneficial in RA patients in order to maintain muscle strength/joint flexibility and quality of life. Non-steroidal anti-inflammatory drugs (NSAIDs) and corticosteroid medications are often used in the beginning for pain relief. The most common method of treating RA, however, involves using a category of medications called disease-modifying antirheumatic drugs (DMARDs). 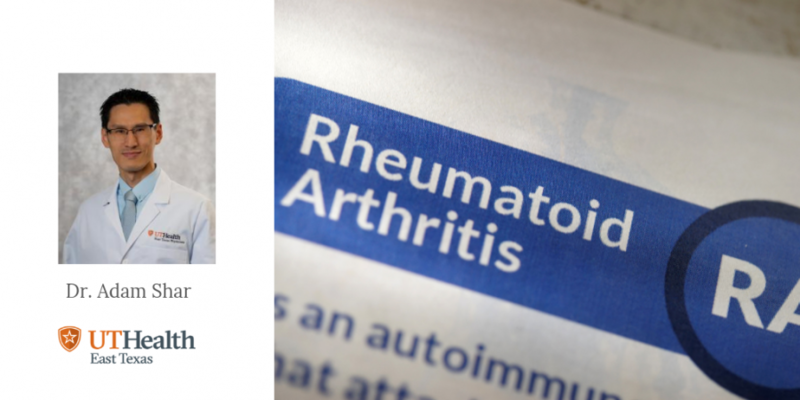 Consulting with a rheumatologist is vital in regards to confirming the diagnosis of RA, optimizing its treatment and long-term monitoring of the disease. In select cases, surgery also plays a role in treatment of RA. This can range from procedures to clean out the affected joints and remove inflamed tissues (synovectomy and debridement) for pain relief and/or to decrease risk of tendon rupture, to salvage procedures such as joint replacement surgery for pain relief and deformity correction. If you have consistent swelling, pain or discomfort in your joints, make an appointment with your physician to discuss your concerns. Call 903-531-8890 to schedule an appointment. 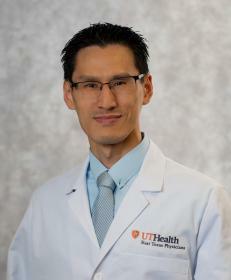 He specializes in treatment of the upper extremities, including fractures or treatment of ligaments or tendons of the hand, wrist and forearm, carpal tunnel syndrome, trigger finger, arthritis, elbow disorders and Dupuytren’s contracture. Wasserman AM. Diagnosis and Management of Rheumatoid Arthritis. Am Fam Physician. 2011 Dec 1;84(11):1245-1252.